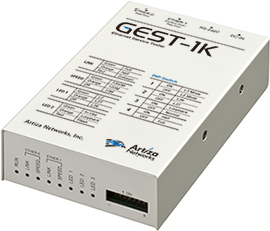 GEST-1K is a small, lightweight and easy-to-use Carrier/Metro Ethernet service tester for speeds from 10 Mbps to 1 Gbps. The device is designed to work without requiring on-site local technicians. Test engineers can control the device remotely from a network operations center. 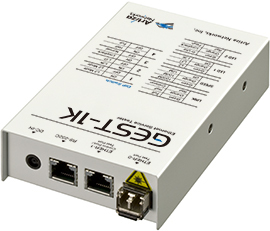 With its minimal size and weight, combined with the capability for wire-line QoS testing and a web-based user interface, the GEST-1K provides cost-effective service and setup testing for Carrier/Metro Ethernet service providers, and it reduces CAPEX and OPEX to support an increasing number of subscribers. GEST-1K makes helps to ensure successful deployment for Carrier/Metro Ethernet service providers, with the best cost performance in the industry. 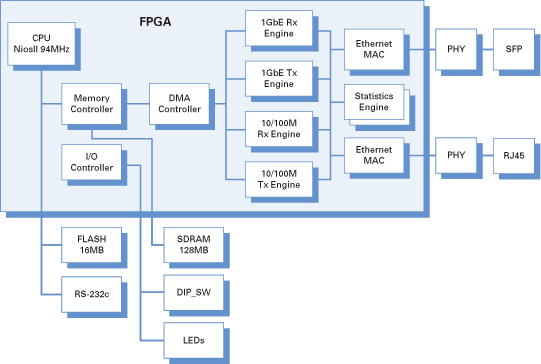 GEST-1K's hardware architecture is very simple: A high performance SoC-based (System-on-chip) FPGA enables most of the functionalities of the product. In addition to the wire-line transmission and capture related engines, the device contains an Ethernet MAC that guarantees no frame loss in Tx/Rx with a shortest Inter Frame Gap (IFG) of 96bits in GbE. 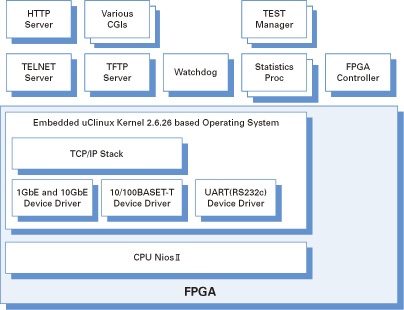 An MIPS-based processor in the device controls the system including the test manager, generation and capture engine, statistics engine and upper layer protocol stacks. The combination of these features brings you the simplest, fastest and easiest Ethernet setup testing with the best cost performance.